The STS-130 crew are undertaking the Terminal Countdown Demonstration Test (TCDT) this week, which will be used as the dress rehearsal launch countdown for the real thing on February 7. Endeavour will be the second orbiter to fly with a suite of sensors relating to Main Engine Ignition (MEI) Acoustic and SSME (Space Shuttle Main Engine) Ignition Overpressure (IOP) Environments – with STS-129’s results already in. Bar some minor foam damage to Endeavour’s External Tank (ET-134), no issues are being worked at Pad 39A ahead of the TCDT practise run – which picks up with Call To Stations (CTS) on Wednesday morning. “Orbiter: OV-105 / ET-134 / SRB BI-141 / RSRM 109 (Pad-A). The team continues to work toward a February 7th launch date. The RSS (Rotating Service Structure) walkdown (completed) 0800 EST this morning with rotation occurring at 1000 EST,” noted NASA Test Director (NTD) Tuesday processing information on L2. Final integration work between the pad and the STS-130 stack is taking place, which resulted in engineers spotting minor foam damage on the External Tank. It is likely the damage will not require repairs to take place, though it will continue to be monitored all the way up to the Final Inspection team evaluations on launch day. 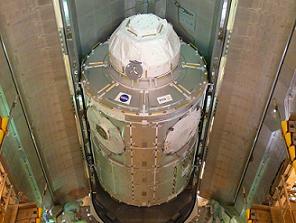 “GOX vent arm GN2 flow validation was completed yesterday. OMBUU (Orbiter Mid Body Umbilical Unit) mate and leak checks are scheduled for today. Aft closeouts began yesterday and continue,” added Tuesday processing information. “S0018 walkdowns for the frozen precipitation experienced during the cold snap last week are still in-work. While there was no damage attributable to hail, the following ET damage was noted during their walkdown. “Foam damage on the side of the Intertank stringer S-6-6 near the L/H GUCP (Ground Umbilical Carrier Plate) foot. Suspect foam damage on the LO2/Intertank flange closeout. Foam damage on the +Y vertical strut. The flow remains on track to support the scheduled launch date, with the milestone of the Node 3/Cupola payload being delivered to the pad completed, along with progress on the arrival of the beefed up NH3 lines for the module still showing an acceptable schedule. “The payload has been transferred into the PCR (Payload Changeout Room). The Payload Canister was lowered onto the transporter and is currently en route to the Canister Rotation Facility,” added processing information. “The PLB (Payload Bay) doors are opened and the payload installed into the orbiter tomorrow. “As you may know, there is still one piece of major open work regarding the ammonia lines (NH3) providing cooling to the Node 3. These lines are installed via EVA and connect the Node 3 to the external active thermal control system (ETCS),” added Tuesday’s MOD 8th Floor News (L2). There have been some issues with the hoses not passing pressurization tests. 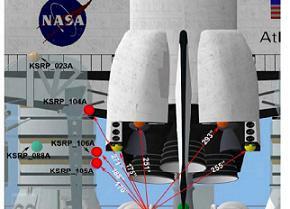 Relating to a potential issue with a very small area of the orbiter – known as a stinger attach point between the Reaction Control System and OMS Pod – engineers have been working to clear concerns that recent acoustic environment analysis of the Space Shuttle Main Engines during ignition can cause stressing that potentially leads to cracks in the attach pins/stinger. 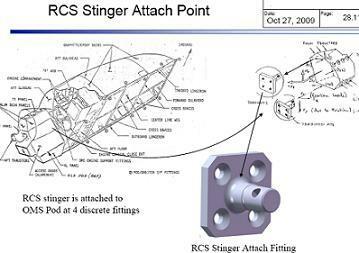 With the data downloaded from sensors in the Mobile Launch Platform (MLP) and from Atlantis’ WLEIDS (Wing Leading Edge Impact Detection System) accelerometers – which were installed into the local area of the stinger during STS-129 – a baseline set of information is now available to engineers. “Provide post flight data assessment of the new TSM (Tail Service Mast) pressure transducers and Orbiter left RCS stinger accelerometers,” opened a review presentation that was created for last week’s Program Requirements Control Board (PRCB) meeting, and available on L2. This presentation confirmed the local environments of the stinger, during the roar of the SSMEs coming to life, was within acceptable levels – so much so that the stinger will not breach age life concerns for 10s of flights into the future. “The data was evaluated and appears good. 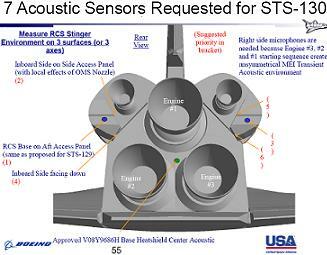 STS-129 Left inboard TSM MEI acoustics were within SE&I updated design levels used in Orbiter assessment,” added the presentation, concerning data from the MLP sensors and the Orbiter sensors. “Predicted responses (were seen) using SE&I updated MEI Acoustic design environment envelope, the measured responses for frequencies of interest for structures. STS-130 will fly with several additional sensors, as engineers cover every aspect of the required data – although these additional sensors would have flown with Atlantis on STS-129, had flow timelines allowed. Given these sensors have no detrimental effect on the orbiter’s systems, STS-131 – and possibly other downstream flights – will also fly with the instrumentation. While this may seem pointless to outsiders, the Shuttle engineer’s mantra of “you can never have enough data” is fitting for this effort. “Forward Work: Instrumentation plan for future flights presented to 12/10/09 PRCB. Similar locations on LH2 TSM, two additional pressure transducers on LO2 TSM. Two microphones and one accelerometer on RCS Stinger. Data from future flights with base heat shield microphone will help identify where STS-129 data falls within the historical distribution,” continued the presentation. Most of the instrumentation that will fly with Endeavour was installed during her time in the Orbiter Processing Facility (OPF) with final work carried out at the pad. This is expected to be completed by the end of the week, with the reinstallation of small Thermal Protection System (TPS) tiles in the area local to the sensors.